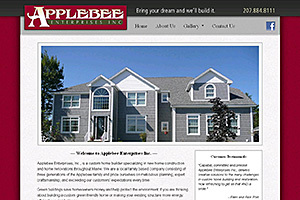 "Applebee Enterprises built our home in Hermon. We loved the process from start to finish and all of the people who worked to build our beautiful home. Tom was great; honest and dedicated to our wants/needs and the finished product is beautiful. I can honestly say that it's sad to no longer see all of their happy faces every day! " "Capable, committed and precise. Applebee Enterprises Inc., delivers creative solutions to the many challenges in custom home building and restoration. How refreshing to get all that AND a smile." Applebee Enterprises, Inc., is a custom home builder specializing in new home construction and home renovations throughout Maine. We are a local family based company consisting of three generations of the Applebee family and pride ourselves on meticulous planning, expert craftsmanship, and exceeding our customers' expectations every time. In addition to our custom built homes, we offer turn-key homes. These homes are ready to move in and are built to your specifications. Because these homes are sold as a finished home, the purchaser can apply for a conventional loan, versus a construction home, making the transaction simpler. If you’re thinking of building a new home, this may be the perfect building solution for you! We understand that building or renovating a home, or commercial property, is a serious financial and emotional investment. That is why our business philosophy is based on integrity, collaboration and customer service. We take pride in our long-standing relationships with our clients, vendors and building partners, and we stand behind our work.